This should be quite an easy one for me – I am very definitely an Autumn person. I have been lucky enough to have my colours ‘done’ so when I go shopping for clothes I know exactly what colours to buy and what to leave in the shop! Makes life a whole lot easier and potentially saves money as you don’t end up buying stuff that you never wear! Hmmmmm…. How does that translate to my happy hooky world. I don’t have a huge stash of goodies I’ve made as I am relatively new to crochet but I would like to think that my love of colours autumnal translates into my stash; so greens, browns, golds, reds (but only yellow/reds, not blue ones), navy, teal, all shades of neutral. No white or black. 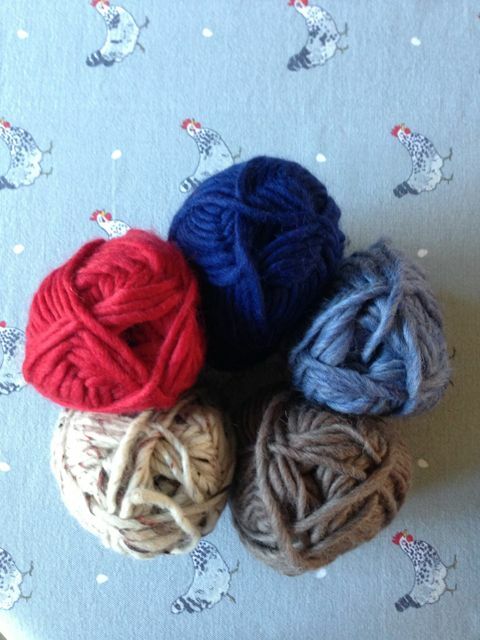 but these are not my normal colour choices, even though they are gorgeous. 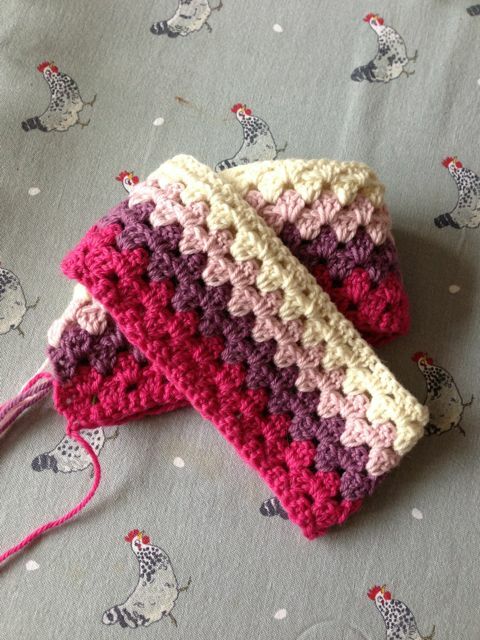 I am also doing a granny square throw for the back of our sofa and these colours fit in well with the room and also my colour scheme – but they would, wouldn’t they, as I chose the paint colours, sofa and curtains! 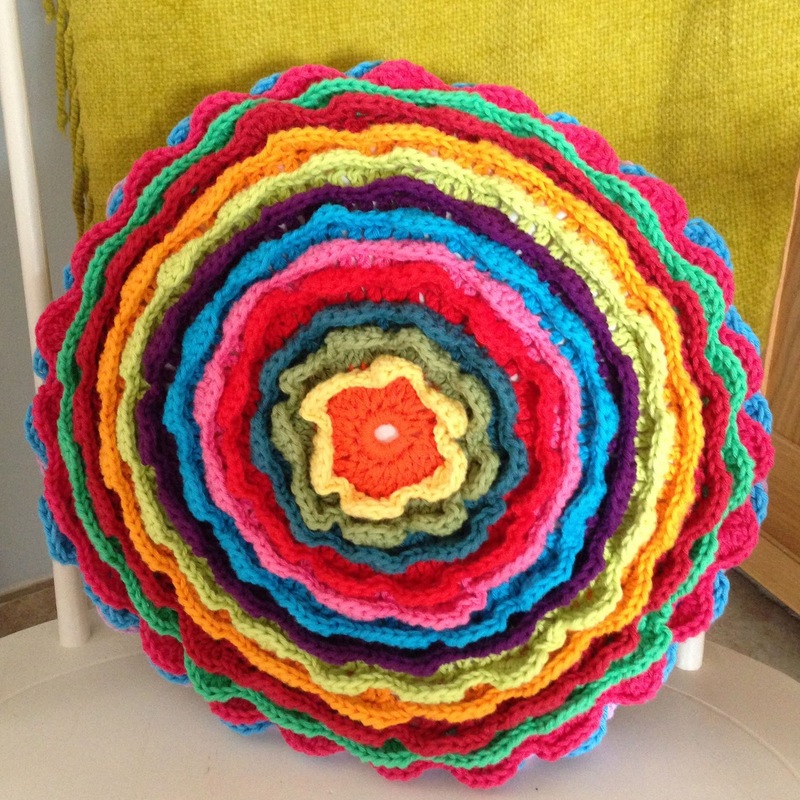 This funky flower cushion contains lots of my favourite colours, but also some I would not normally choose, but I do love all the bright colours together and where it sits (in the kitchen on my rocking chair) it looks great. 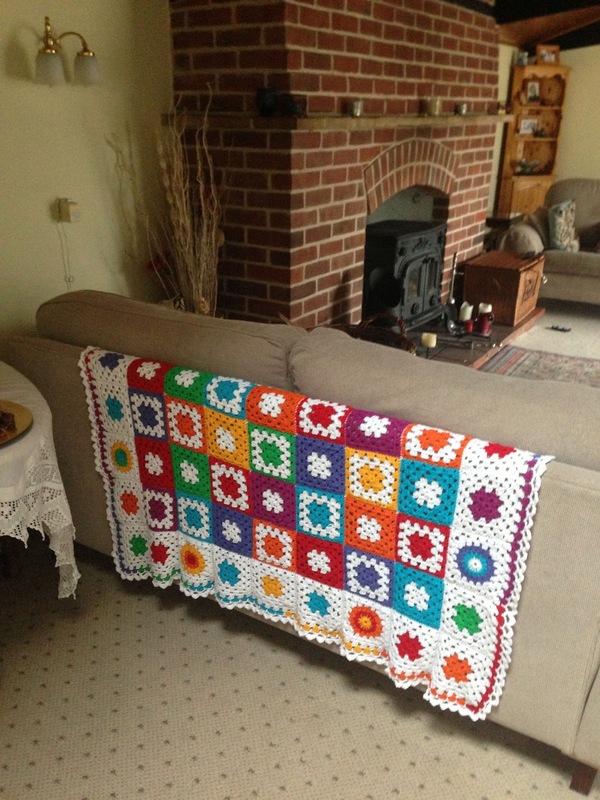 Finally my first crochet project – my bright granny square blanket. I think a lot of the colours are ones I would normally be drawn to – all except the white actually which is not one of my colours but sets off the whole project – it just wouldn’t have looked the same in cream or a beige background! So, if I were to relate my colour choices to my choice of house (the Bee) would there been a connection! Hell, yes – just look at all those bright colours and think of all the beautiful flowers that the bee visits to get pollen. I am a busy bee, flitting from one colour to the next and getting my inspiration from the things around me. How cool is that!